Marshall's Mill was a water-powered grist mill located on Shoal Creek, two miles north of Catawba and three miles west of Proctorville in Caldwell Co. It was built by George Marshall who was born about 1824 in Ohio. Family tradition holds that Marshall built the mill soon after the Mormon insurrection of 1838. 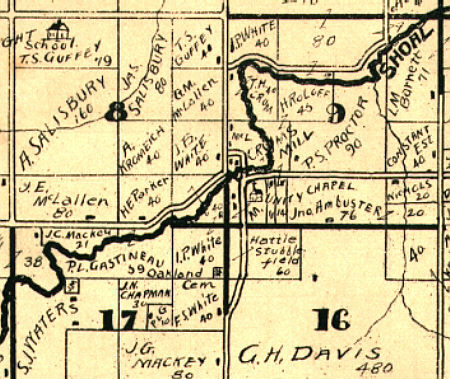 However, at least two of Marshall's children were born in Virginia after 1850, and no mill is identified on a map of this area published in 1876. George Marshall's daughter and son-in-law, Elizabeth and Isaac M. Minnick, operated the mill for a time. Mill ownership was subsequently passed to Samuel Marshall, son of George, born in 1851. Samuel Marshall took on a partner, a Mr. Dye. 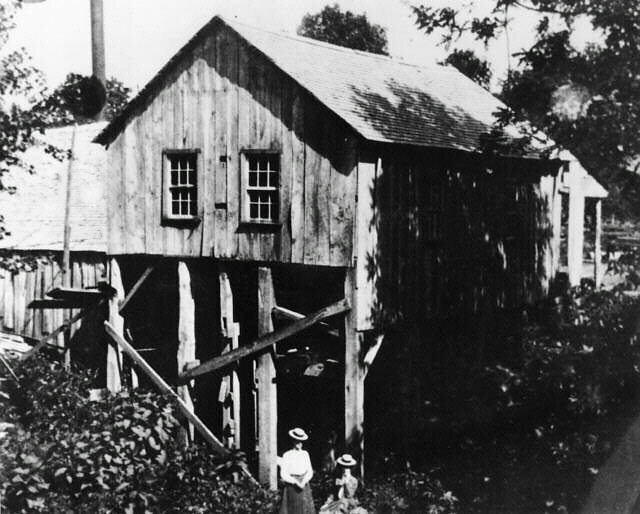 About 1899, Samuel's daughter and son-in-law, Bessie and John Riley O'Dell, bought Mr. Dye's share in the mill. Dr. Bertha Booth, well known Caldwell County historian, wrote in the decade of the 1930s that "the millstones from Marshall's Mill were recently dug up and sold as relics." Thanks to Dan Riegel of Atlanta, Georgia, for sharing this photo of the mill! 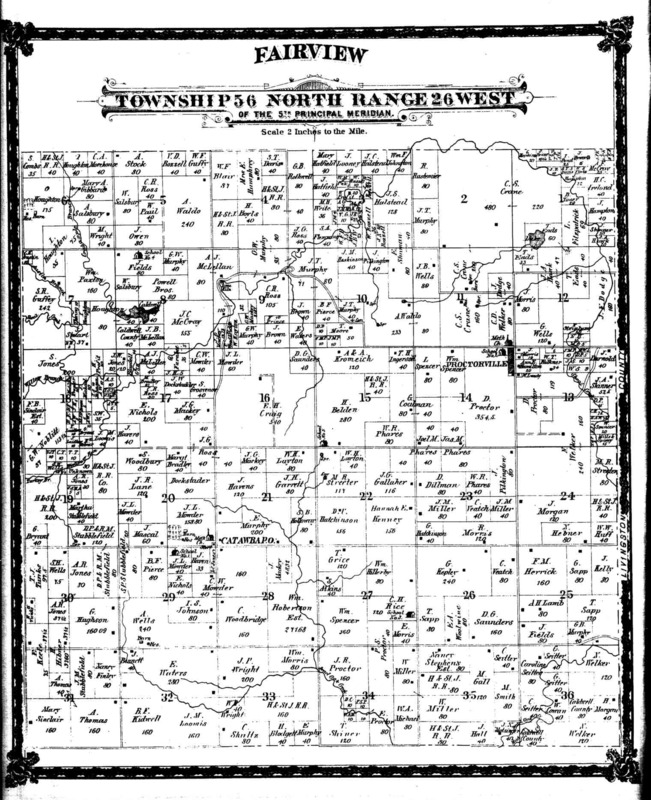 Published in 1907, this map identifies the place as Crum's Mill. 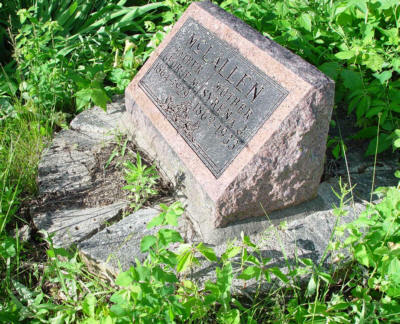 The gravestone of George M. McLallen (1864-1929) and his wife, Syrena J. Pennington (1869-1933), rests on a millstone that was probably used at Marshall's Mill. Alvin J. McLallen, father of George, owned the future site of Marshall's Mill in 1876. George Marshall, original owner of the mill, lived with the Alvin McLallen family in 1880 and probably built the mill at about that time. The millstone is segmented, the parts held together by a heavy metal band, and is reputed to be made of French limestone.